US-Japan joint meeting on "Wind and Seismic Effects" was held. 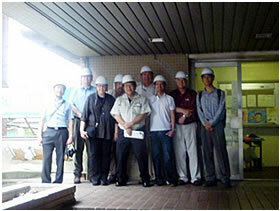 The 43rd Joint Meeting of United States-Japan Panel on Wind and Seismic effects was held at the Public Works Research Institute in Tsukuba from August 29 to 30, 2011. The Panel is going under U.S.-Japan Cooperative Program in Natural Resources (UJNR). The Building Research Institute (BRI) is one of main institutes in Japanese side. In the meeting, the information about earthquake and its effects in the Great East Japan Earthquake was exchanged. Also a five-year strategic plan of the panel was discussed. Staffs of BRI contributed reporting the recorded earthquake motions and damage to building due to earthquake motion and Tsunami. And they had important roles such as co-chairs for summarizing the discussion for Task committees B (Buildings), D (Wind Engineering) and H (Storm Surge and Tsunami). The panel members visited Tohoku region from August 31 to September 1, 2011 and carried out a joint field reconnaissance to investigate damage to retrofitted buildings, seismically isolated buildings, and buildings designed based on the current code or the previous code in Japan. A workshop on motion induced building damage was also conducted in Tohoku University with Prof. M. Maeda.